The economy is on a tear. There are many “next new things” coming to the marketplace, generating private investment to produce new goods that are in high demand. Firms that invest are seeing gains in after-tax corporate profit, thanks to expansionary fiscal policy from tax cuts and accelerated depreciation on new capital goods. There is also increased spending on military. And don’t forget deregulation, which is enabling businesses — especially small businesses — to thrive. But the economic expansion has many observers spooked by the fear that booms will inevitably turn into busts, “just as they have in the past.” So today there is a growing chorus of observers expressing nervousness about the implications for economic and financial market performance. They do have a case to argue, as there is an endogenous mechanism that can turn an economic and financial boom into a bust. So how likely is that? Here is the script — you decide whether to extrapolate it. When spurts of demand growth outpace labor force growth (as is occurring now), labor becomes relatively scarce. Efforts to increase output further translate into employers paying premium wages to attract workers. This occurs when there is a very small labor pool that remains on the market, so wages almost have to rise. And if wages grow faster than labor productivity (that is, if you are paying more and labor is not producing more), there is an increase in labor costs per unit of output. In the next step of the “boom-to-bust” chronology, employers seek to raise product prices so as not to compromise their profit margins as labor costs rise. In addition, demand growth — driven either by the next new thing or the next new government spending program — exacerbates supply-side shortages. The higher input prices then spread to other inputs including energy, transportation, raw materials, financing costs, etc. As producers attempt to pass along the cost increases into higher product prices, it sets in motion classic “cost-push” inflation. This is a dramatic change in the environment following the weak, drawn-out, nine-year recovery from the Great Recession. The civilian unemployment rate is now 3.8%, a low last seen at the end of the decade-long expansion of the 1960s. The current situation is that job openings exceed available labor, and the quit rate is at an all-time high, indicating that labor is gravitating to higher-paying jobs. What a startling change from the struggles of the past decade. The economy is responding positively to a myriad of next new things (and/or government-provided new things) against a backdrop of heroic monetary expansion during the Great Recession, followed by deregulation, tax cuts, incentives to repatriate corporate capital held abroad, and heavy-duty investments in military and transportation. The demand side of the economy is now doing its part. Labor compensation at small and independent businesses has been steadily increasing for the last few years, and now prices of goods are also increasing. The graph below, from the National Federation of Independent Business’ monthly small business survey in May, illustrates this trend: the percentage of participating firms that are raising prices (shown in blue) is growing alongside the portion of firms that are increasing compensation (shown in red). It should also be noted that the consumer price index rose 2.8% for the year ended in May, a trend that has started to make the bond market and the Federal Reserve uneasy. We have now crossed the inflation divide. “The Index of Small Business Optimism increased significantly in May to 107.8, a large gain of 3.0 points. This is the second highest Index reading in its 45-year history. 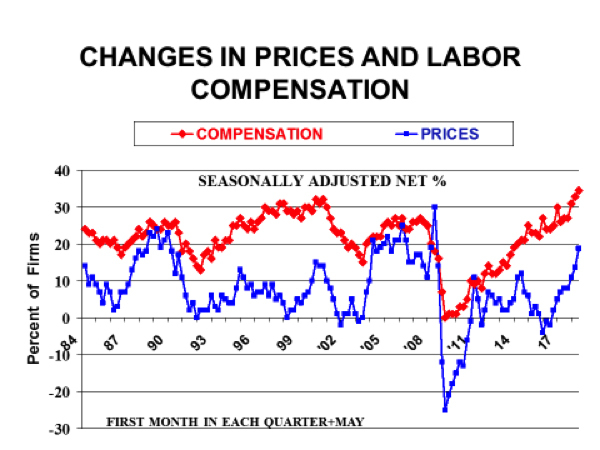 Reports of compensation increases hit a 45-year record high. At this point, it’s safe to say the Great Recession is behind us and the concern has shifted to the ramifications of higher inflation. This in turn sets off reactions. 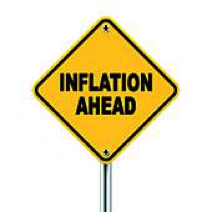 First, the higher inflation rate will cause the financial markets to change course when it becomes clear that it will continue. In an inflationary environment, investors reduce the amount they offer for bonds or other investments where the derived income is a fixed amount. Or to put it another way, bond investors only invest if the fixed yield they receive is increased to compensate for the loss of purchasing power from expected future inflation. Expectations of rising inflation thus reduce investors’ willingness to hold bonds; indeed, bonds funds have recently experienced net redemptions and a decline in the market price of bonds. From there, the rise in inflation causes the central bank to tighten, which is usually done through some combination of bond sales and higher interest rates charged on loans to its bank clients. The central bank logic is that higher interest rates are a disincentive to purchase goods that require financing, thus containing the demand side of the economy so as not to further overrun supply. But these days, with so much debt expansion as a result of the Fed’s Quantitative Ease during the Great Recession, higher interest rates serve to increase debt service on existing debt when it faces refinancing at higher market rates. I have seen estimates in the area of $100 billion annually of added debt service in the offing. This amount would be roughly ½ of 1 percent of GDP — a large but not insurmountable drain on income that would otherwise be spent. But the bigger concern for veterans of past booms and busts is the sense that with all that debt on the books of consumers, businesses, and governments, what follows are defaults and losses to the entities holding the defaulting debt. Those often have been banks, which are then assaulted by depositors in a panicked run. In the housing boom, financing was extraordinarily concentrated in loans for residential structures, with homes being the collateral. By the time the housing boom reached its zenith, overbuilding in the housing sector significantly reduced the market value of the houses that served as collateral on bank loan portfolios. There will be far less financial system vulnerability this time around, as there isn’t a similar concentration of financing to a single overbuilt industry. The closest over-expanded and over-financed sector is consumer auto loans, which would be considerably less of a debt drag. Much has changed since the last financial crisis. Banks have rebuilt their capital and liquidity to meet far higher safety standards. Indeed, the largest 37 bank holding companies — which hold 80% of total banking system assets — recently passed the regulatory stress test for capital and liquidity against a worst-case default scenario. To be sure, there will be losses to holders of defaulting debt if there is another “big one” — but these losses will be spread out, making the overall system less vulnerable to a repeat of a financial crisis a la 2008. All in all, the game-changer right now is the ripple effect from the inflation generated by the recovery. The cost of financing purchases will become more expensive. Financial assets will generally be marked down if their income streams don’t keep pace with inflation. Enlarged debt service will drain income growth without decimating it. All this occurs on the other side of the inflation divide.